2019 Watershed Forum – Plan to Attend! 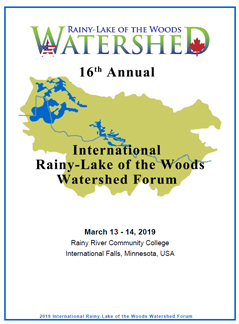 For the 16th year, the Rainy-Lake of the Woods Watershed Forum is set to bring together the many researchers, resource managers, organizations and interested public together to share information on the health of the Rainy-Lake of the Woods watershed ecosystem. This year’s Forum features sessions on binational updates, foundational work for establishing water quality objectives and alerts, sturgeon recovery on the Winnipeg River, a series on the Experimental Lakes Area and updates on Environment and Climate Change Canada research, to name a few. For the full schedule and to register, go to https://lowwsf.com/our-work/watershed-forum.